-- Please Choose an Option --	CDAK12 - 12" x 19 1/16" x 2 5/8" CDAK15 - 15" x 19 1/16" x 2 5/8" CDAK18 - 18" x 19 1/16" x 2 5/8" CDAK24 - 24" x 19 1/16" x 2 5/8"
Click the button below to add the Merillat Masterpiece® Utensil Drawer Organizer to your wish list. Angled Utensil Organizers, allow even the long cooking utensils to easily fit into drawers, so everything stays nice and neat. It's a nice product, but the sizes listed above are not accurate. I ordered the CDAK15, which is listed as 15" x 19 1/16" x 2 5/8". The actual width was 10". 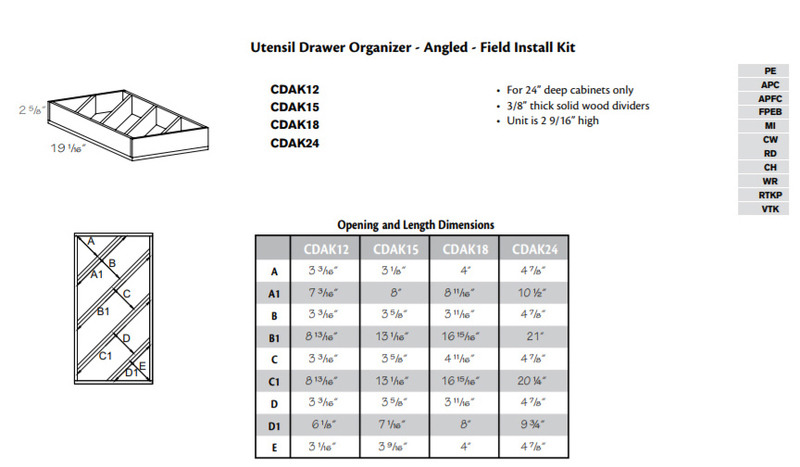 10" is the standard inner width for a 15" cabinet drawer. The CDAK15 seems to be sized for a 15" cabinet; it is NOT 15" wide. After measuring my drawer I ordered the largest size tray , which cost the most. The organizer I received was smaller. I measured the sent organizer and looked it up. The one I received was several dollars cheaper than what I paid. I should have either been sent the correct size or received a refund.